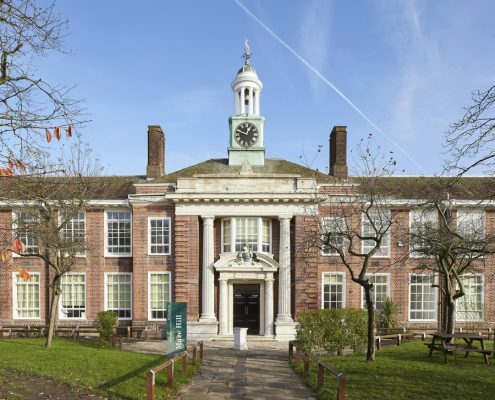 John McAslan + Partners was appointed in 2010 to remodel John Roan School’s existing Grade II listed building at Maze Hill and to provide a new 7,600 sqm school and community building at Westcombe Park. 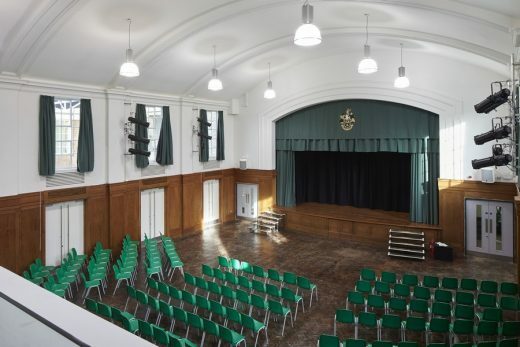 The 1,400-pupil secondary school is split across two sites adjacent to Greenwich Park; the Maze Hill site is in the Greenwich Park Conservation Area, and the Westcombe Park site is in the Blackheath Conservation Area. 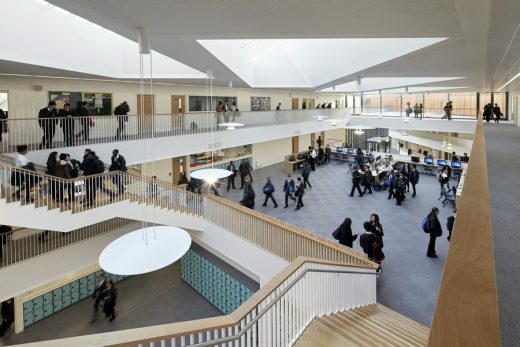 The refurbishment and extension of the existing grade II listed neo-Georgian Maze Hill building involved the remodeling of classrooms and internal circulation, and the addition of an ETFE roof over one of the internal courtyards to create a new dining area, a learning resource area and ICT breakout space. 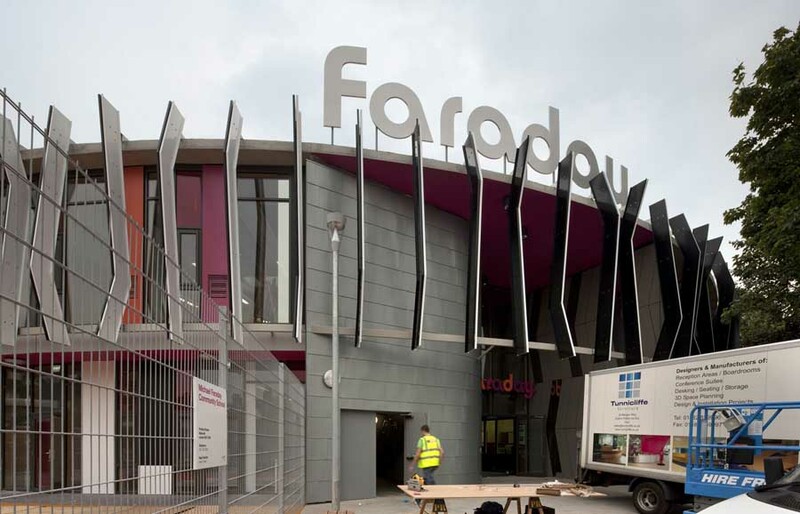 The new building at Westcombe Park provides a range of flexible, transformational learning environments, alongside a sports and amenity building which can be operated independently as a community facility. 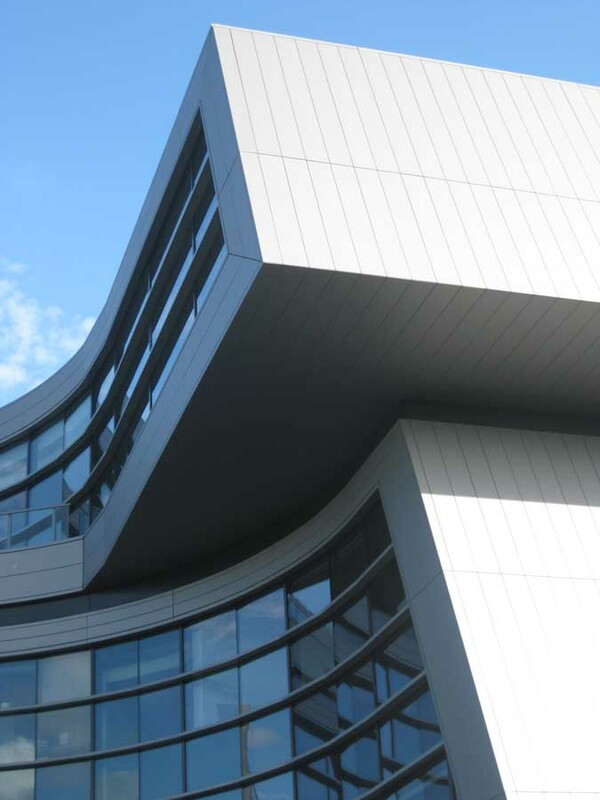 The accommodation is arranged around the dramatic central atria, animated with a series of link bridges at upper levels; these provide a series of open learning environments. 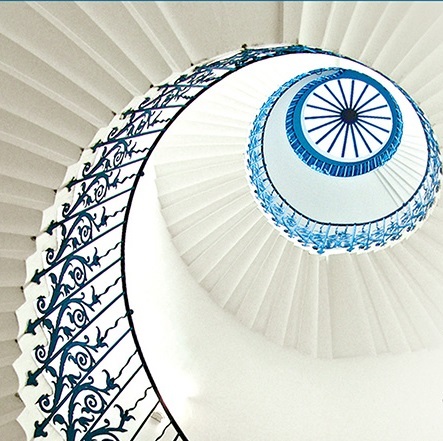 The entrance foyer is conceived as a dramatic ‘hub’; an impressive, flexible space featuring an open stair incorporating generous stepped seating for informal gatherings, break-out and performance. The ground floor of the Main Education Block includes classrooms, a central dining space at the heart of the school, design and technology labs, music and drama rooms and office accommodation, while the ground floor of the Sports Block accommodates a drama studio, activities studio and DSP and SEN facilities. 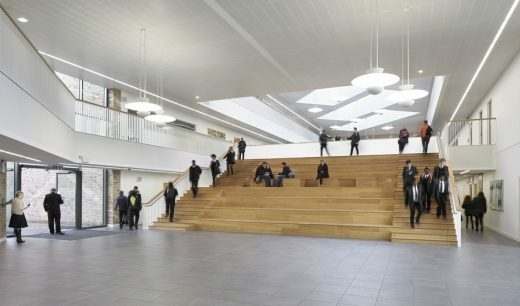 The first floor of the Main Education Block provides further classrooms at the perimeter, open plan ICT break out areas at either end of the atrium void, staff bases, while the equivalent level of the Sports Block consists of a sports hall and changing facilities. Science laboratories, prep room and classrooms are located on the second floor of the Main Education Block alongside an open learning resource centre, other staff and office accommodation and a winter garden. 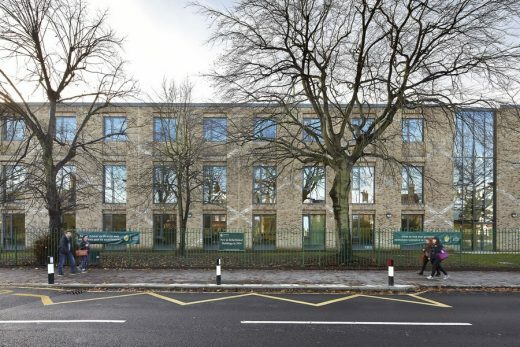 To help articulate the massing of the Westcombe Park building, two bricks, differing in colour and texture, are used to create a facade with a rich overlay of diagonal brick patterning, adding craftsmanship and a detailing to reflect the local context. 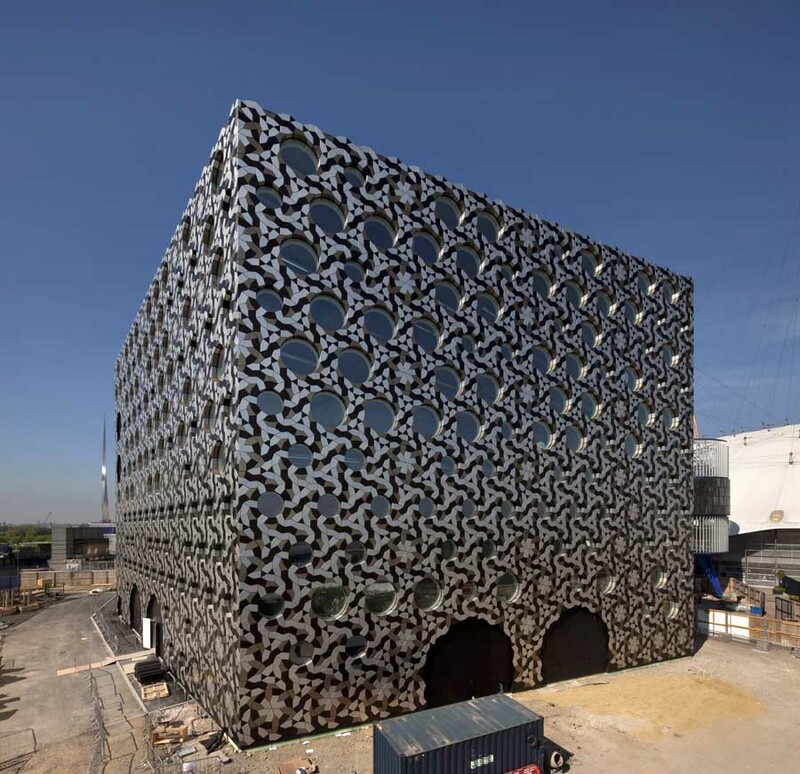 The building was developed with sustainable engineering at its core – air tubes provide passive heating and cooling through thermal mass transfer with the ground, offsetting` mechanical cooling and heating energy. Solar hot water collectors provide baseload for hot water heating to the sports hall block, with a PV array on the roof of Westcombe Park generating clean electricity.